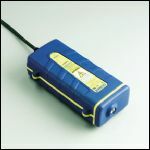 The CADWELD PLUS ONE SHOT produces a permanent exothermic connection to a ground rod that will not loosen, corrode or increase in resistance for the life of the installation.The convenient single-use package makes the connection to the ground rod without a mold or starting material.Thanks to the electronic CADWELD PLUS Control Unit, welds can now be completed up to 6 feet (1.8 meters) away, increasing flexibility in hard-to-reach areas.The new refractory ceramic body utilized with the CADWELD PLUS ONE SHOT system is more durable than conventional ceramic and resists breaking. The CADWELD PLUS Control Unit, which is required to initiate the reaction, is ordered separately. cULus is a registered trademark of Underwriters Laboratories, Inc.